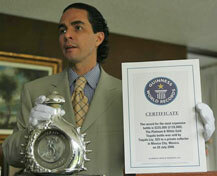 Tequila Ley 925 receives certificate from Guinness World Records for the most expensive bottle. How much would you pay for your favorite bottle of Tequila? 50 Us Dlls? 100 Us Dlls? On July 21, 2006, a Tequila connoisseur paid US$225,000 for a bottle of Pasion Azteca, Platinum Tequila. This sale was certified as "the most expensive bottle" by Guinness World Records on 23 October 2006. Fernando Altamirano, CEO of Tequila Ley .925, sourced and completed the deal. "This is a really unique Bottle of Tequila and our client, a US based collector of fine wines & spirits, will treasure this prize to add to an already impressive collection." This limited edition series of Tequila has only 33 bottles finished in Platinum and White Gold. According to Guinness World Records, the most expensive bottle of spirits was sold at auction in Milan in 1992, when an unknown bidder paid £45,483 for a 50-year-old bottle of Glenfiddich single malt whiskey.